Handheld aviation radios are one of the most important communication devices a pilot can have while flying. They can make communication possible in the cockpit in case the aircraft radio fails and as well keep you safe on the ground while walking around the airport. In other words, they facilitate effective and reliable communication throughout ensuring the safety of all those on board. As new brands enter the market, trying to figure out which one is the best can confuse you. But, after careful analysis of the top rated options, we present the five best models that are well suited for the cockpit. Portable radios come in different designs with different features but what makes the best model is not just about having great features. It’s also ease of use, long battery life as well as easy-to-read keys and display. In light of this, we’ve also included a comprehensive guide alongside the reviews of all the five radios and it’s our hope that it will come in handy when you are going through a number of other options. 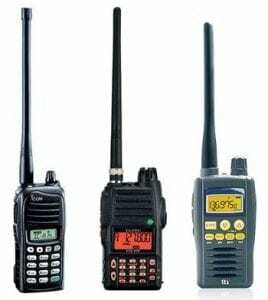 Icom is a very reputable brand in aviation and has a very long history of crafting top quality aviation radios. Their IC-A14 model does not disappoint. It’s very reliable in every aspect and can be used by both aviators and ground crew. The unit is light and very well made with a compact body that fits nicely in your hand. There are no sharp edges but it’s quite rugged, so it provides a firm grips making it easy to hold it. It seems simple and smaller than most of its other competitors, but its performance is remarkably good with regards to reception and transmission of audio. The sensitivity of the antenna is very good and is even able to catch the weakest of signals. It’s backed by a 700mW BTL amplifier that boosts the audio output. Plus the noise from the surrounding is greatly reduced during transmission. So, you get loud and clear audio even when standing in high-noise areas like near a running helicopter or plane. Aside from clarity, the transmission range of this IC-A14 radio is also quite impressive. You can receive transmissions from almost 25 miles away and transmit more than 5 miles. It’s an ideal model for airport operations both ground and in flight. The unit offers a total of 200 memory channels and you can group them into 10 memory banks for fast and simple operation. It receives both NAV and WX channels. And there is a NOAA weather receiver that allows weather reception from very far even beyond the range of most standard airport stations. The best part is that you will not have to worry much about the battery dying on you wherever you are out on the field. It features a 2000mAh Lithium-Ion battery which is the largest capacity on this list. It will provide stable output power and can last over 15 hours on a single charge. To sum it all, the IC-A14 is a simple but highly reliable radio that does its job well. The only minor issue you will face is programming it. It’s a little tough at first and can take a while to get the hang of it but once you get it down, it’s flawless. If you are looking for reliability at a good price, then this the radio for you. It’s the perfect option for small cockpits, ground use and as an emergency backup in any aircraft. Plus the display has a backlight which stays lit once you turn it on. The Yaesu FTA750L is a very versatile radio that’s equally capable of facilitating reliable communication and navigation both in the air and on the ground. The overall construction quality of the unit is really good. The rig is solid and all connectors are protected by rubber boots. So, it can hold up well to frequent use although it falls a bit on the heavy side. The buttons are small but have a great tactile feel which makes it easy to operate them even for people with big fingers. The display is slightly larger compared to the other models and although it does not match that of an iPhone, it’s legible with enough contrast to allow you read it in bright sunlight. In terms of performance, the FTA750 is certainly one of the most diverse radios you will get. It provides clear and quality communication whether flying through the air or operating on land. The antenna is in good shape and is powered by an 800mW amplifier that provides adequate power to pick up signals. The squelch function works well and quickly. It is easy to adjust if you want to pick up weak or distant signal. So, the unit does provide a solid connection. Aside from the clear communication, another thing to like about this unit is the robust navigation system that it has. It offers VOR and ILS navigation with the addition of a GPS navigation system. The GPS receiver is quite reliable. The only gripe is that you have to load the waypoints manually but you get to navigate to them with accuracy. The battery charges fairly quickly and has a large capacity (1800mAh). It can last more than 10 hours with a single charge. Programming it is a little involving and does not seem to pair with iOS devices. These are the only two issues that you are likely to face with this Yaesu FTA750 model. Otherwise, it’s a solid unit that packs in a lot of great features. If you are looking for a more advanced aviation radio that can effectively serve as back up comm and nav radio in case of an in-flight radio failure, then the Yaesu FTA750L will serve you well. It’s only compatible with Windows operating system. In the third position is the FTA550L which is another well-built transceiver from Yaesu to make it on our list. Like the FTA750L, this Yaesu model is quite versatile and offers a good number of features. It’s also very similar to the FTA750L in terms of design but the navigation system is not as robust. The unit is built to last. The case is very solid including the antenna and the whole body is rugged to provide sufficient hand grip. It will handle hard knocks as well as withstand the elements as it also features an IPX5 water protection setting. You will also be able to comfortably use this Yaesu radio in different situations. The display is large and clear in bright sunlight, and the backlight is adjustable which makes it a breeze to operate it in low light conditions. The quality of sound and reception is excellent. The antenna captures transmissions easily and similar to the FTA750L, it’s powered by an 800mW amplifier. So, it will pick up distant signals that most other devices would miss. The maximum transmission range is 5 miles. As for navigation, the FTA550L is a very capable device but not to the level of the FTA750L. It can effectively pick up VOR signal and automatically shift to the NAV screen where it shows a CDI according to the received signal. The unit also supports ILS localizer navigation but not ILS glidescope navigation plus it does not have a GPS function. These are the only two main things that put the FTA750L model ahead of it. You can program up to 200 channels and assign each a name using 15 alphanumeric characters. It’s a bit easier to program compared to the FTA750L and the Li-Ion battery pack is good too. It can hold charge for at least 10 hours. Generally, the biggest differences between the FTA550L and the FTA750L, are the GPS and ILS glidescope navigation. Other than these everything else is pretty much similar. It’s a solid unit that can last for years and does its work as expected. 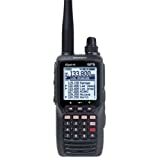 If you primarily need a radio for communication functions but don’t mind having some navigation capability, then this is an option worth considering. 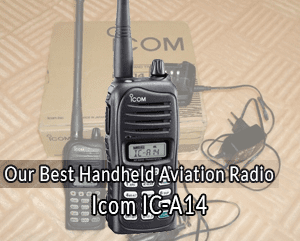 The IC-A24 takes the fourth position on our list and stands out as the best built portable aviation radio on our list. 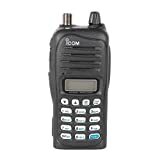 It’s a unit developed by Icom which like I mentioned earlier has a reputation for reliability. For a start, the IC-A24 has a solid, water-resistant construction with a rugged surface like all the other models on this list. It’s light and fits nicely in the hand. The keypad is well labelled and the buttons are not rigid. They respond quickly when pressed. The display is larger than that of the IC-A14 which is a big plus as it’s easy to see and it shows both number and letters. You will also have no problem operating this Icom radio at night. The keypad, as well as the display, are backlit and unlike other models where the light goes off after some time, this stays on until it’s turned off. Now one of the areas that Icom radios continue to beat most of their competitors, is their ability to pick up signals. Their models provide unrivalled reception and this IC-A24 model cements that reputation. Whether in the air or on the ground, the antenna of the radio provides great reception. It’s powered by a 700mW amplifier which further boosts its sensitivity to transmission signals. You will be able to pick up even the faintest of signals with this unit. But it’s not just the great reception. The audio quality of this Icom model is equally superb. It utilizes the auto-noise limiting technology and also allows you to control the gain on the microphone. So, the audio signals transmitted come out loud and very clear even when you are operating in a noisy environment. For navigation, the unit comes equipped with VOR navigation functions that can help you stay true to course throughout. It has a good DVOR function that displays the radial to/from a VOR station and a CDI mode to show the course deviation to or from a VOR station. The battery management, however, is not the best. There is no indicator to show the actual charge in the battery but it does give out an alert signal before it shuts down. Nonetheless, the battery capacity is good. It can provide you with more than 15 hours of continuous use. Well, the only other issue to worry about is probably programming which is not that hard but just a little bit challenging. Once everything is set, accessing the channels is easy. To sum it all, the IC-A24 is a reliable aviation radio that’s built to last. It’s a good alternative to the Yaesu FTA550L if you are looking for reliability with regards to voice transmission and has the added benefit of the VOR navigation function. The Baofeng UV-5R is not the most powerful option on this list but it offers the best value for the money. 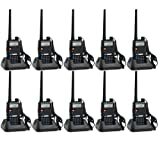 It’s an economical dual band UHF/VHF handset that’s ideal for anyone who need a portable radio at low cost. The unit is strong and sturdy with a cast that’s made from a durable material which makes it ideal for rough usage. In terms of weight, this is the lightest model on this list and feel very comfortable to hold. The screen is fairly large while the buttons are nicely spaced, so it can be operated easily. Although it does not feature any navigation function, the unit receives and transmits quite well. The stock antenna is powered by a 700mW amplifier. It has a strong reception and it’s replaceable should it start to malfunction. However, the highlight of this Baofeng radio is the fact that it allows two-way communication and the voice transmission on both ends is loud and clear. Along with this, the voice prompts work great. You can easily use it in the dark or single-handed without having to look at it. It can support up to 128 channels which is a bit low compared to the other models above but if you are not a heavy user, it will do just fine. The battery capacity, on the other hand, is fairly large and can last more than 12 hours with moderate usage. The only major setback with this handset is that it does not feature any navigation function. 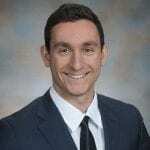 However, it will not pose any challenges when it comes to programming the channels. Overall, it’s a solid unit with good value for money and an ideal choice if you are looking for an affordable handheld radio specifically for communication purpose. The design and quality of construction are vital when it comes to selecting a handheld aviation radio because it will determine its durability as well as ease of use. If you are going to use the radio frequently, you should ensure that the case is solid and sealed well. The surface should be fairly rugged to facilitate a firm grip when holding the radio in your hand. The next thing you should evaluate is how user-friendly the handset is for your needs. This will majorly depend on the size of the keypad and the display. A unit with a small keypad and display will be hard to read and operate. So, you want to make sure that both are large because the larger they are, the less challenging it will be to read and use the handset. It’s also important to be able to operate the radio in low-light conditions or at night. As such, you should ensure that both the keypad and display have a backlight so that when you press a button they both light up allowing you to easily operate the device without straining much. The prime purpose of a handheld aviation radio is to facilitate communication and as such, one of the vital things that it should provide is a great reception. The key things to check here is the sensitivity of the antenna and the wattage of the amplifier because the power output for all handheld radios is limited to 5 watts of transmit power. So, it will not change much. Most units have stock antennas and though they are not the best they still have good sensitivity. In this case, you might want to go with a whip antenna over the stubby antennas. The latter is highly portable. You can easily put it in your pocket but can reduce the range by up to 30%. However, a whip antenna offers longer range despite being a bit tall to fit in a pocket. It’s more effective at picking up signals. Aside from the antenna, the amplifier of a handled aviation radio plays a significant role in determining its ability to effectively pick up signals. It does not actually make audio transmission over the radio better considering that the power output of handled radios is limited to 5 watts. However, it helps power the antenna making it more sensitive to signals. Therefore, you should consider a unit that has a powerful amplifier. One that will be able to pick up the faintest of signals that most other ordinary communication devices would miss. The ideal option here is an amplifier that offers 700mWh or above. The higher the better but 700 to 800mWh is sufficient for most handheld aviation radios. It’s enough to enable a proper stock antenna to pick up even the weakest of signals. On top of having a good antenna and a powerful amp, you should also consider units that have an auto-noise limiting technology. The Icom IC-A14 and IC-A24 above are good examples. They both have an Auto Noise Limiter for noise reduction. This is quite an essential feature to have because you will be operating in a noisy environment. Therefore, you need the audio to be loud and clear, and the auto noise limiter can facilitate that. Not all handheld aviation radios will offer navigation functionalities. Nonetheless, it’s an essential feature that you must consider if at all you are not looking for a COMM-only transceiver. That said, almost every NAV/COM handset is equipped with atleast one form of navigation while others have a robust system equipped with multiple types of navigation. The most basic models offer VOR and even ILS receivers which are quite useful when flying IFR. Along with VOR, some units will feature CDI which makes navigating even easier. The more advanced models have also GPS system installed. Generally, the kind of navigation system you will need will come down to the type of operation you fly. However, it’s much better to go with a unit that’s versatile so that you will be able to utilize different navigation options without having to get another device. Having a good and reliable battery is paramount especially because you are going to use your handset as a backup or during emergencies. Most units will come equipped with Li-Ion battery while there are some that have a battery pack consisting of AA-type batteries. Between the two, Li-Ion batteries are the most ideal because they are rechargeable and last very long. AA-type batteries also last for long but will always have to carry spare batteries plus they require more attention from you so that you can replace them on time. So, Li-Ion batteries have a big advantage which makes them a good option. 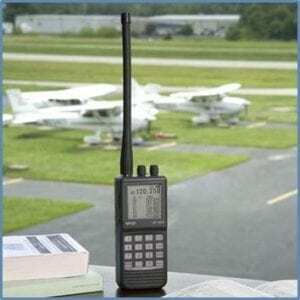 There are so many factors to look at when evaluating the quality of a handheld aviation radio. However, these four are the main areas you want to focus your attention on. They will help you determine the durability, functionality and usability of each radio based on your particular needs and as such be able to make the right choice. Aviation is a very challenging field, one where everything has to be in order to ensure the safety of all those on board. Therefore, effective and reliable communication is very important. The five handheld aviation radios on our list stand out the most amongst their peers in terms of reliability and quality. 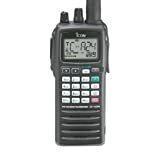 They are some that are quite versatile like the Yaesu FTA750L and FTA550L while others like the Icom IC-14 and IC-24 offer very effective communication capabilities. All in all, the type of handset that you will select will ultimately depend on your specific needs and there are a wide variety of handheld aviation radios on the market to choose from. But if you don’t want to go through all that trouble, then you can consider one of the options above.